so, i read some where that anything worth doing would’nt be easy. for someone who always seemed to get their way i would laugh at that idea. that is, until now( and all of 2008 really). nothing is easy these days. and the amount of behind the scenes polying is incredible. i will speak on that in some other post though. come on out this saturday and enjoy some music, drinks, and positive energy! we’ves witched up the format this time round. 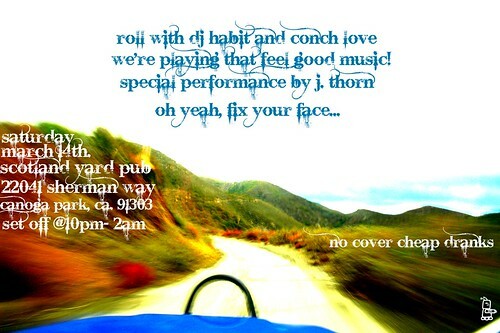 dj habit and i will still be spinnin them tunes, but we have a live performance goin down by j. thorn! as always we go on at 10, but you can join me for the warm up shots round 9. i mean, everyone should warm up before a work out right?